There are two types of forums in the LSU instance of Moodle, (1) Announcements, and (2) the Forum. The Announcements can be created by adding the Latest News block. For instructions on how to create and use an Announcement, see GROK article #18320. The link to the Announcements is initially placed at the top of the first topic area on the course front page, but you can move it to other locations if you like. Only participants who are in a role that allows editing (such as the Primary Instructor, Non-Primary instructor, or TA) can create posts for the Announcements. Students can only read Announcement posts and cannot reply to them. Posts to the Announcements are automatically emailed to all participants in the course (because subscription to the Announcements is set by default.) Also, all Announcement posts appear in the Latest News block on the front page of the Moodle course. 1. Standard Forum for General Use - All participants in the course can create an UNLIMITED number of discussion topic threads. 2. 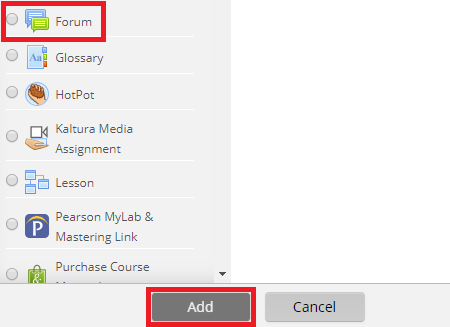 Standard Forum displayed in a Blog-type Format - All participants in the course can create an UNLIMITED number of discussion topic threads. 3. Q & A Forum - Students must submit a reply to the initial discussion post BEFORE they are able to view the Forum Replies of other participants. 4. Each Person Posts One Discussion - Every participant in the course is allowed to create ONLY ONE discussion topic thread. Replying to other posts is unlimited. 5. A Single Simple Post - The text in the Forum Introduction becomes the initial discussion topic post. Replies are unlimited; however, additional Discussion Topics CANNOT be added after the Forum is created. For instructions on how to create a forum, visit GROK article 18506.